RHP / 21 years old / 6’4″ 192 lbs. 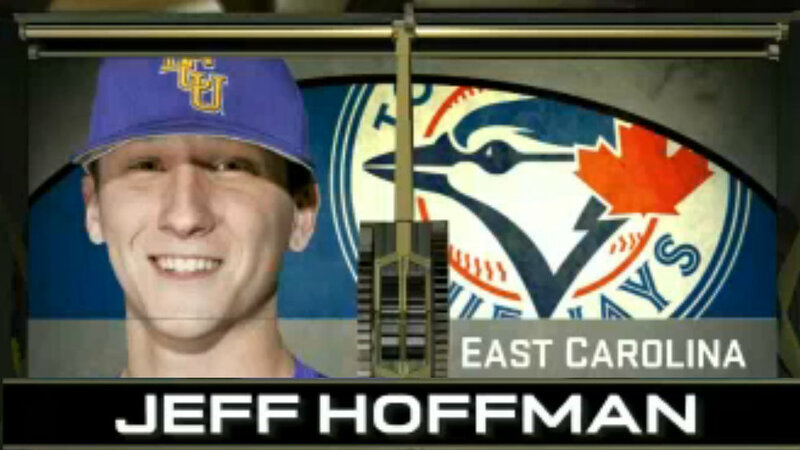 The Blue Jays love to draft a good high risk, high reward type of player and ECU’s Jeff Hoffman is no different. With their first selection in the top 10 in nine years, Toronto opted to take the hard-throwing righty at No. 9 despite the fact that he had undergone Tommy John surgery less than one month ago. One doesn’t have to look too far back to see when the Blue Jays were in a similar situation. Two years ago—the last time Toronto had two picks in the first round—the Blue Jays were linked to hard-throwing high school righty Lucas Giolito with the first of their selections at No. 17. Giolito was considered one of the top players in the 2012 draft class thanks to his triple-digit fastball before a pre-draft elbow injury caused him to tumble down draft boards. The Nationals wound up snatching Giolito right before the Jays with their pick at No. 16, and after undergoing Tommy John shortly after draft day, Giolito is Washington’s No. 1 prospect and widely considered one of the top arms in the minor leagues. There are notable differences between Hoffman and the Giolito comparison above—considering Hoffman is a college junior and more advanced developmentally come draft time—but the Blue Jays could very well find themselves in a similar situation to Washington when Hoffman projects to make his highly-anticipated pro debut sometime in 2015. According to Hoffman in a great interview with the New York Times, his “long-term goal of making an impact on a big league team within two years” hasn’t changed even after having to have Tommy John surgery. While I love the drive and confidence—elsewhere in that article Hoffman says he feels he’s the best player in the draft—you can bet the Blue Jays will get him to improve his changeup and make sure his delivery is sound before he even sniffs the high levels of the minors, let alone the Show. As you can tell in the videos farther down, Hoffman has a prototypical pitcher’s frame that is long, lean and still has room for projection, notably in the lower half. His delivery is fluid with easy arm action and a high leg kick, and it’s easy to see him generate velocity from impeccable arm strength. While I would think the Blue Jays will look to get Hoffman more balanced with his front foot as he finishes, his delivery is repeatable for the most part. Depending on how Hoffman commands his pitches once he turns pro—and I’m purely speculating here—I could see his stride getting shortened down the road to get more on top of the ball. Ranked as the top prospect of the Cape Cod League last summer, Hoffman’s best offering is considered to be his electric fastball, a pitch that he threw in the mid-to-high 80’s before attending ECU and is now throwing in the 92-96 mph range with the ability to touch 98 and stay at that velocity deep into outings. According to ESPN, “the key to Hoffman’s arsenal is his curveball, a hammer of a pitch that has drawn Adam Wainwright comparisons. It has true 12-to-6 break, with good spin and he maintains his arm speed through the pitch.” You can see in the videos below that Hoffman is comfortable throwing it to his glove side at both left and right-handed hitters, and he’ll be sure to get many whiffs on the pitch as a pro with that kind of break. Also noticeable in the footage below is Hoffman’s two-seam fastball, a pitch that definitely has above-average sink, life and arm-side run like Baseball America reported. Rounding out Hoffman’s impressive repertoire is an 86-89 mph changeup that has flashed plus with good, late fade according to Baseball Prospectus, and a “show me” slider that ESPN dropped present 40 and future 45 grades on. Given the Jays’ poor track record of signing their top pick over the past three years, you can sleep well knowing that, as ESPN’s Keith Law astutely pointed out in his most recent mock draft, Hoffman will have no leverage when it comes to negotiating with the Blue Jays and is considered to be an easier sign. As a college junior that will be out until at least this time next year rehabbing from Tommy John, it’s impossible for Hoffman to pitch in college again in an attempt to boost his draft stock. So even though the recommended slot value for the No. 9 pick is $3,080,800, the Blue Jays will almost surely bank some of their bonus allotment when signing Hoffman and use that money towards other selections in the coming rounds. ‘Good things come to those who wait’ as the old saying goes, and waiting for Hoffman is exactly what the Blue Jays will have to do for now. Given Toronto’s precious handling of their top pitching prospects in recent years, one could guess that Hoffman would stay through extended spring training next season and make his pro debut next summer. A 2016 season-opening assignment in Dunedin could be a safe bet, with a potential major league ETA being sometime in 2017. “Hoffman entered the year as the top collegiate right-hander in the draft class, and through two weeks he’s reinforced that standing on stuff, if not production. Prior to his Tommy John surgery, Hoffman had a strong case for top overall draft prospect in the class, featuring a heavy mid- to upper-90s fastball, a plus mid- to upper-80s changeup with good arm-side fade, and a plus to plus-plus curve with big depth and good snap, coming in the 77 to 81 mph range and proficient at slowing down bats and changing hitters’ eye level. “Hoffman was on radars before his impressive summer, but his dominating Cape Cod League performance has escalated him from a potential day one selection to a guy who could challenge Carlos Rodon for being the first pitcher off the board. Hoffman’s fastball is a dynamic pitch when he’s on point, sitting in the mid 90’s and will occasionally touch 98 mph. A few times this summer he was more 92-94, but based on his body and arm strength scouts believe he is capable of sitting in the mid 90’s at the next level. Hoffman right now is the prime example of a pitcher having good control and not great command. He generally keeps the ball in the strike zone, but he sometimes struggles with location within it. He does have a clean delivery, though, and repeats his delivery fairly well, too.